I’m not a car guy. Never have been. Never will be. I don’t dislike them. I just don’t want to work on cars. I can change the oil and switch out a battery if I have to, but it’s not real high on my list of things I look forward to doing..
Years ago, I used to wax my cars 10 or 12 times in the summer. Not anymore. Do they still sell Turtle Wax? When I was in high school, I worked a short time for Gene Voss, who did body work on cars at the shop in his garage. He also had a used car lot for a while. I cleaned for Gene. I did a little sanding. I taped vehicles for paint, detached some old fenders so Gene could put on new ones. I even drove a few cars to the local sand-blaster, who was able to remove rust a lot faster from a quarterpanel than I could with my sheet of rough sandpaper. For a few months, I even pondered getting into the business myself. I had a 1971 Chevy Impala. I don’t remember the color. My Grandpa Bowman sold it to me. It was in pretty good shape, but I decided to fix it up. My friend Bill Suver also was an amateur car restorer, which means he painted his pickup this god-awful shade of orange one time. Anyway, in the back of Suver’s Grant Street home was a garage just perfect for working on cars. We we started working on my Impala. I remember pulling the seats and taking them to Mansfield for new upholstery. We may have ordered carpet from the JC Whitney catalog and installed that, too. We replaced some lights, cleaned out the trunk. (True fact: you can fit four regular sized people in the trunk of a 1971 Chevy Impala and sneak them into the drive in theater). Mostly Bill and I sanded the rust off that Impala and filled in some holes with Bondo and sanded all of those down. Then we taped up the windows and sprayed it with primer so it could be painted. I talked to Gene Voss and asked him how much it would cost to have him paint it for me. My timing was good. Gene was getting ready to go on vacation and needed a bunch of chores done around his house. I spent maybe three days weeding, raking, cutting and pruning and Gene painted my car for free. It was a dark brown as I recall. I thought it looked pretty great. Two weeks later my sister took my car out on a Friday evening and was in an accident with a hit-and-run driver. No one was hurt. The hit-and-run driver was subsequently charged and his insurance paid for the damage, but that kind of knocked the momentum from my car-restoration dreams. My ‘71 Impala was never the same in my eyes. It had been violated. Since then, my cars have trended to the boring side. The first new car I purchased was a red 1979 Ford Pinto. I bought it at the Ford dealership in Galion on Bucyrus Road. Yes, there was one. One day a few years later, I pulled out of my apartment driveway in Columbus and I heard a pop. A few seconds later I saw flames beneath the hood. There was nothing I could do. Someone had already called the fire department. It’s an odd feeling to sit on your front porch watching your car burn. After than I had an ‘85 Impala, also courtesy of Grandpa Bowman. I think I drove it until it fell apart. I can’t remember the car after that, or the one after that. I may have had a Mustang, and even another used Impala. I know I bought a new Chevy Malibu, and then a new Cavalier in 2002 that still runs. But it is sitting in my driveway with a wasted transmission. It has about 240,000 miles on it. Make me an offer! Now I’m driving a Ford Ranger. Although I don’t like to work on cars. I enjoy looking at old classics and fixed-up hot rods. There used to be a huge, national hot-rod car show that came to Columbus every few years. At the time, I was working at a Wendy’s on Busch Boulevard. Also at that time, there were a lot of hotels in the area with huge parking lots. And during the car show, they were filled with colorful street rods. At the time — I’m guessing in the mid 1980s — the local police allowed street rod owners to take them to — I think it was Sinclair Road, off of Morse Road — and allowed the drivers to burn rubber. I remember there were hundreds of people lining that road in the evening watching those hot rods. I don’t go out of my way looking for car shows. However, if I see one, I’m likely to do a walk-thru. I’m not into engines, but I love paint jobs and fixed-up interiors. My neighbor, Joe Kochheiser, has been fixing up vehicles for years: panel trucks, Volkswagons and more. If you’re a car-show regular you know of the Bear’s Lair and the Volkswagon Beetle he had years ago that was an homage to one of the Muppets. The blue one. Coming up next weekend is the annual Pickle Run Festival. It’s car show is Sunday morning and there will be dozens of vehicles there for your looking pleasure. Russ Kent is editor of the Galion Inquirer, Bellville Star and Morrow County Sentinel. Email him at rkent@aimmediamidwest with comments or story ideas. Don Tudor | Galion Inquirer Visitors look over R.L. Dudley’s 1930 Ford coupe last September at the Galion Historical Society’s car show. There is a car show this Saturday, June 24, starting at 9 a.m. at Brownella Cottage. It features the Ford Edsel. https://www.galioninquirer.com/wp-content/uploads/sites/38/2017/06/web1_Russ-Kent-colsig-4.jpgRuss Kent is editor of the Galion Inquirer, Bellville Star and Morrow County Sentinel. Email him at rkent@aimmediamidwest with comments or story ideas. Don Tudor | Galion Inquirer Visitors look over R.L. Dudley’s 1930 Ford coupe last September at the Galion Historical Society’s car show. There is a car show this Saturday, June 24, starting at 9 a.m. at Brownella Cottage. It features the Ford Edsel. Visitors look over R.L. Dudley’s 1930 Ford coupe Sunday, Sept. 25, at the Galion Historical Society’s car show. Photo by Don Tudor. https://www.galioninquirer.com/wp-content/uploads/sites/38/2017/06/web1_historical-society-car-show-2.jpgVisitors look over R.L. 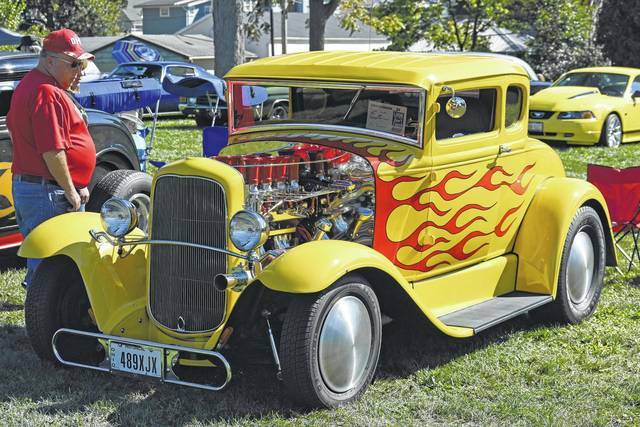 Dudley’s 1930 Ford coupe Sunday, Sept. 25, at the Galion Historical Society’s car show. Photo by Don Tudor.